There was a strong local flavour at the 2017/18 Victorian Greyhound Awards at Melbourne’s Crown Casino recently. In a great night for local greyhound followers, Sandown chairman Neil Brown was awarded the Ken Carr medal for excellence within Victorian greyhound racing history, while breeder/owner/trainer Ashlee Terry was awarded the Ned Bryant ‘Silver Fox’ Award. 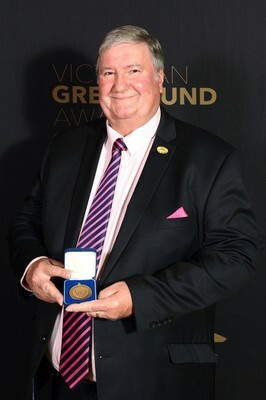 The Ken Carr Medal is considered the highest award for excellence within the Victorian greyhound racing industry and Brown – a greyhound administrator and historian – has held roles in greyhound racing for almost 50 years. “I’m never lost for words but my family have kept a great secret here,” Brown said. Brown has bred and trained greyhounds, been a member on the Victorian Greyhound of the Year Panel, the original Topgun Panel and still contributes greatly to the GRV’s Hall of Fame Committee, as well as having held the position of CEO at Greyhounds Australasia. It was a chance introduction for Brown that started his love for greyhound racing. “I was waiting to buy footy finals tickets outside MCG, and a friend I was with said let’s go across to Olympic Park and have a look at the races,” he said. 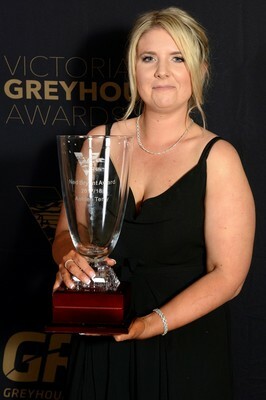 Terry, a 27-year-old greyhound breeder and trainer from Cranbourne South claimed the Ned Bryant ‘Silver Fox’ Award – recognising outstanding achievement in the training, breeding or promotion of greyhound racing. Terry claimed her first Group 1 win as a trainer with Maja Mahi Mahi in the 2017 Sapphire Crown and has had stunning success as a breeder also. 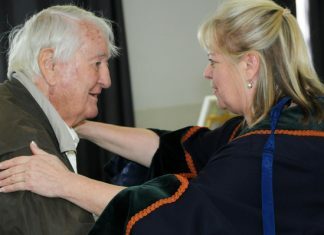 “I’m very honoured and very surprised and a little bit nervous,” Terry said. Terry thanked Andrew Paraskevas, along with trainer and rearer, Karen Leek. “I’ve wanted to be a greyhound trainer since I was five years old and I think we’ve improved a lot since we’ve been trainers,” she said.